After all the hype and the discussion on how expensive it is and was, we have a great feeling of satisfaction and no regrets whatsoever. It is definitely a magical and untamed race, always with the unexpected and testing your limits and abilities continuously. The start was huge and somehow set the tone for the whole event. After the pouring rain of the registration day before, the skies were blue and the air crisp and the sun shinning brightly. We were really lucky and fortunate with the weather for the whole event, with no rain to speak of to add to the already muddy tracks. The views were always spectacular and breathtaking on every single day. The variety of terrain makes this race something special. Almost everyday you would ride just about every type of terrain imaginable, forest, jeep track, rolling hills, open roads, tar, passes, single track, mud, rock, sand, technical climbs, steep down hills, fast down hills, the list goes on. 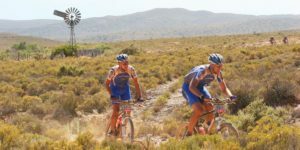 Everyday on the epic was tough even the last day at 45km had some of the steepest climbs technical single track and tricky river crossings. Our team goal was to finish the race and that was our focus. So our strategy was to start easy and ride the first 4 days comfortably below 70% HR and then re-assess how we felt. Day one we started right at the back and were in no hurry to get going, catching up and chatting to known and unknown riders as we made our way to the start of the climb out of Knysna. It was very muddy which meant that bikes took strain, progress was slow because of the climbing and the slow descents through mud and long sections of flooded roads and tracks. We stopped at all the water points, ate, refilled water, stretched and applied some lube. The last bit was a climb up to Saasveld that we shared with another team which made it quite enjoyable and meant it passed quickly. Jokingly discussing the final sprint tactics for the finish, we all coasted over the line feeling happy that we had made the first day. We rode day 1 in preservation mode, in anticipation of a tough day 2 and Alan was feeling flu/cold symptoms. We finished day 1 in 7:45, we both felt good, although Albert’s ITB had started playing up. After finishing we set about establishing our daily routine of eating, washing our bikes, checking bikes, lubing bikes, showering and then finally resting. Day 2 started nicely out of Saasveld but quickly came to a grinding halt with a long wait/walk as we queued to get through a river crossing and up a steep bank just 2km into the start. After 45 min with fresh wet and muddy shoes we were finally on our way. The day actually turned out a bit easier than we expected, probably because we had not pushed too hard on the first day. Also it was a bit easier in terms of climbing but was longer and hotter which took it out of you if you did not have enough left for the end. After the initial bit of climbing we rode a long section of rolling jeep track on the side of the Outeniqua mountains overlooking George and Mossel bay. We felt good and with a bit of momentum we got into a rhythm on the ups and downs and switchbacks. Albert managed to sort the ITB out by pedaling properly, stretching and concentrating on his foot position. Albert also had a close call with a car going down one of the dirt road passes, he managed to keep control and stop just in time, before going through an oncoming cars windscreen. The descent into Herbertsdale was long and fast and came sooner than expected due to a fortunate miscalculation on our side. The race village was perched on the hillside with great views, but the dinner marquee was all the way down the hill, which was quite a challenge with tired legs. We had our first massage, which was a welcome relief after more than 8 hours on the bike. Day 3 was the “easiest day”, only because there was not much in the line of technical stuff or major climbs, although at 104 km and 1400 m ascent it was no joke. After gaining some ground on day 2 we made it into a seeded start group zone D. This was great as the pace was way up for everyone and all tried to make up time and take advantage of the bunches of riders and open flat roads. We finished in Riversdale into the wind, as usual the finish line was full of festivities, no matter whether you were the first or the last rider in, a great way to finish the day. Finishing in less than 5 hours meant that we had extra time to do some washing and give the bikes a good clean and service after the initial tough and long first two stages. Day 4 was a wake up call again and definitely one of the hardest stages of the race. On paper it didn’t look too bad but on the ground it was another story. The 15+km loop through Grootvadersbosch Reserve turned out to be quite a challenge. It started out technical and just got more and more and more technical. It was all ride able but only just, the last section was a tricky and long downhill track section, which was very steep and very technical. With my shock completely out of air this decent was tough and way more strenuous than it should have been, but we made it through with no falls, no punctures and no bike damage. The final stretch into Barrydale was up the Tradouw pass that was hot and long. But the amazing scenic beauty meant that it passed by quite quickly and before we knew it we were in a sprint finish to catch up a few positions. Day 5 was another surprise, on paper it looked like a reasonable day with 107km and 1135 ascent. But this again was not the story on the ground and it ended up being a bit longer with more ascent and plenty of walking. The going got really rough with some down hills and up hills that were not ride able due to the loose sharp rocks and steep inclines. Once again we were lucky to get away with no falls and no bike damage. The day was great though with some amazing scenes going through the Sanbona Game Reserve and some other eco reserves. The last bit into Montague was a long rolling down hill dirt road. Leading a rather speedy bunch into the finish we managed to hold most of them off and finished a few positions up the log again. Day 6 on was slightly shorter due to some changes in the route and had a long 28km tar section. But this only lead to an incredibly steep and loose rocky climb that had to be walked again. The line of riders disappeared over the top of the hill as riders pushed and carried their bikes over the loose rock. After getting over this section there was a long undulating hills section followed by a climb into Villiersdorp. Here we arrived to the cheer of amongst others thousands of crickets who made their way into bags, shoes, camelbacks etc. Day 7 was another tough day with an 800m climb straight up after only 20km into the race. The loose rocky climb was ride able, but after 8 days of riding it took a lot of concentration and pedaling to stay on the bike. The decent was awesome from above the clouds, through the mist and into the valley. Following a mix of tar, sand road and track we eventually reached the Franschhoek pass climb. It was hot and smelled of tar from all the ongoing road works. The decent on the other side was cool and fast. Then we just had to hang on to the finish, going around Franschhoek and not through as planned. 20km out from the finish we had our first and last puncture, thanks to a small patch of thorns. We made up some time again and passed the 2nd placed ladies for the first time in the race to get our best stage finish of the race, 60 overall and 43 in class. The finish at Boschendal was great, amongst the shaded trees and the green grass. 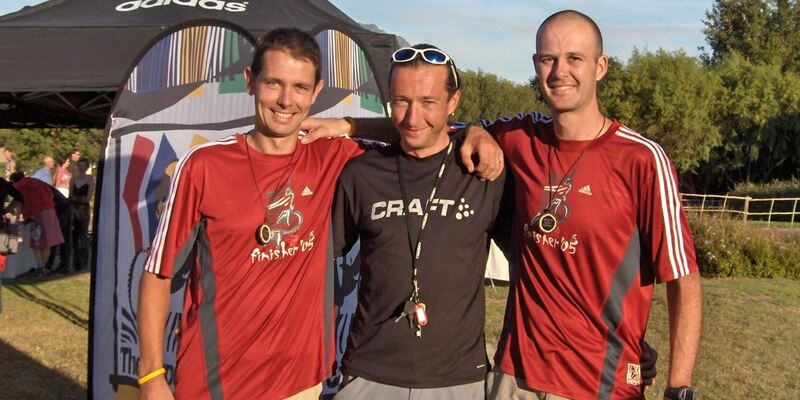 Dion, our Astute sponsor, was there to surprise us, after flying down from JHB to see us at the finish. Gourmet fast food was also to be had with the R10 tannie burgers making way for the R20 gourmet burgers. 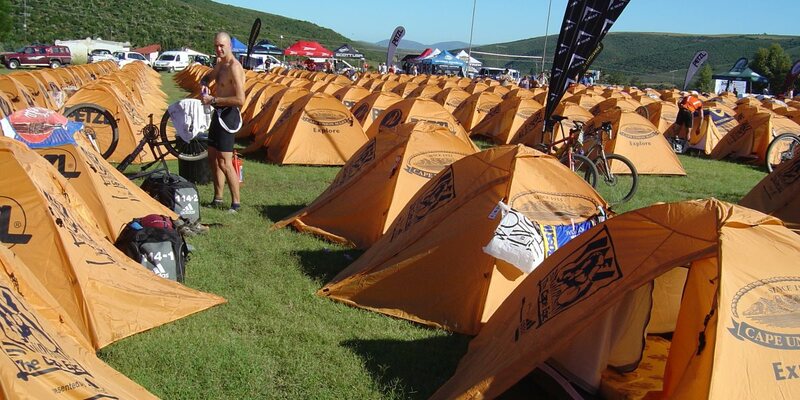 The finish was shaded and cool, a welcome change from the hot Villiersdorp camp the night before. Day 8 was technically challenging and not just a walk in the park. There were some steep tricky climbs that need brute force to pedal over. Overall it was a great stage with lots to technical riding, cool down hills and great single track. We rode at a comfortable pace not wanting to crash out or make race ending last minute mistakes. 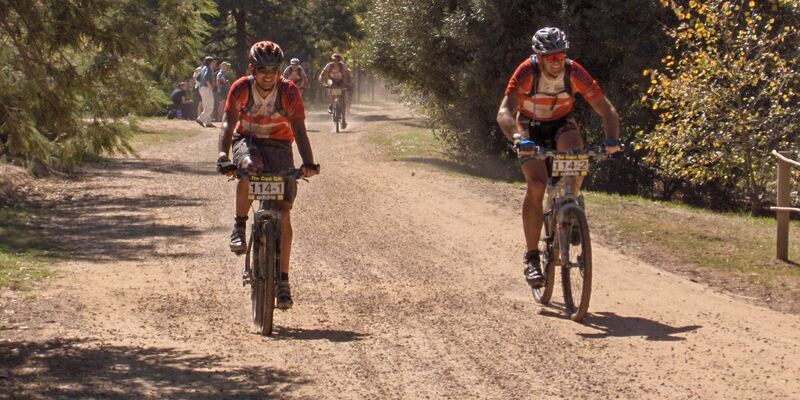 The finish was great coming into Spier, full of twists and turns and several river crossings. We rode in to waving fans (Candice and Belinda) and the sound of bagpipes thanks to Hilton. We crossed the line just like we had done everyday for the last 7 days, only this time we didn’t need to rush off and wash our bikes. We had a really good race and ended up finishing comfortably. 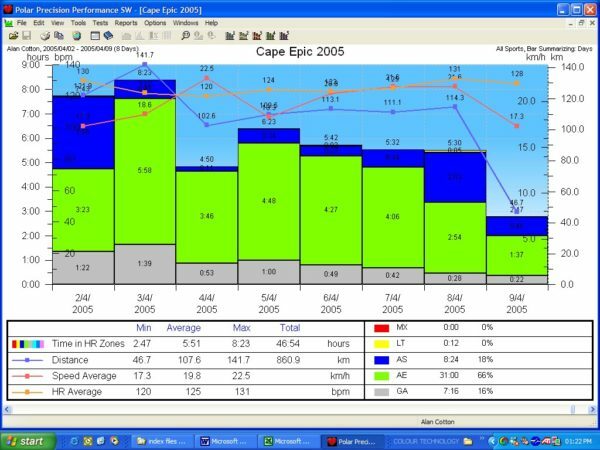 Looking at our HRM downloads afterwards it turns out that Alan spent only 12 min above 80% and Albert only 5 min above 80%. We finished strong everyday and never really had a bad day to speak of. We rode the first two days very comfortably and started pushing a bit after the 4th day. Body wise Albert suffered a bit with knee pain from day 2 already. But with a bit of medication and pedal positioning he managed it, but was in quite a bit of pain by the end. Both of us had neck or back pain at some stage but got it sorted with massages. My knees also hurt by the end, but not that badly. My legs were stiff and sore for the first 5 days, then they started to feel better after that, although they also started to get a bit weak by then. We had a massage every 2nd day and that seemed to work well. Thanks to proper training, quality cycling shorts and clean fresh kit everyday, we didn’t have any saddle sore problems. Food wise we drank at least 500ml per hour and ate something every hour when riding. Post ride we also ate something immediately, either a pre made sandwich or else a delicious burger made by one of the local town tannies. Off the bike we ate as much a physically possible at dinner and breakfast. We also had snacks regularly during the afternoon. 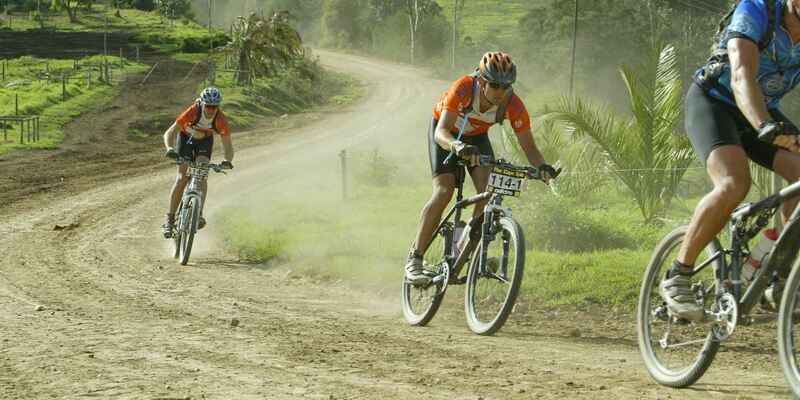 We can definitely recommend this race to anyone who loves mountain biking. 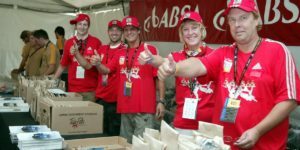 It is as absolute celebration of mountain biking in South Africa. To be able to spend over a week just riding your bike, talking about riding and bikes, meeting other riders from South Africa and the rest of the world, being in the same place as the worlds best riders and just plain hanging out is an experience not to be missed. For us it was a unique opportunity to get a glimpse into the dream world of a pro bike rider and see what it must be like for a pro bike rider, who lives eats and sleeps riding. 8:00 The days race starts with a bang as usual. Its like starting a big race with big crowds from the local town and theme music, announcers, waving flags etc. Ride for 5-8 hours stopping only to wee, rest, water points, apply lube or walk up an un-rideable section, otherwise riding through water, mud, dust heat, cold, on sand, tar, rock, grass while seeing awesome scenery and passing waving hands & friendly faces. 15:00 Find the race village, pick up your bag from the bag truck/tent and then find a tent amongst the thousand. 15:15 Head off to the bike wash, find a hose with pressure a bucket and a brush to wash your bike, check everything is working and lube everything up for the next day. 16:30 Find a cool shaded spot to relax and stretch. Take a walk into town. 18:00 Go to dinner marquee for dinner, eat as much as you can – Rice & stew/curried chicken, pasta and beef stroganoff/chicken al king, braai pap & steak/chicken, mince and pasta, salads, pasta salad, bread, jam, deserts, and fruit. 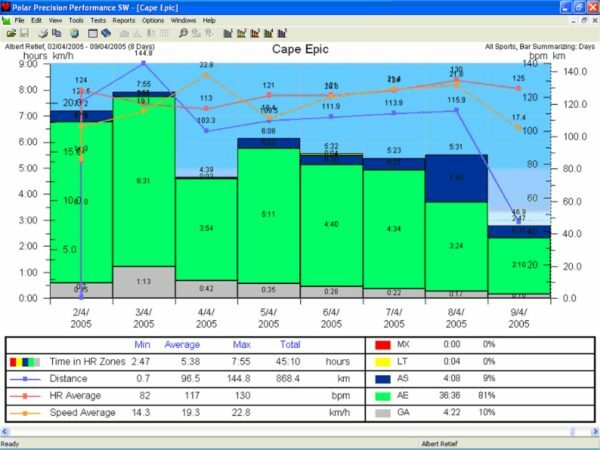 For more info on preparation, training and all our epics check our Cape Epic Guide.